NOTE: This content is old - Published: Thursday, Sep 22nd, 2011. 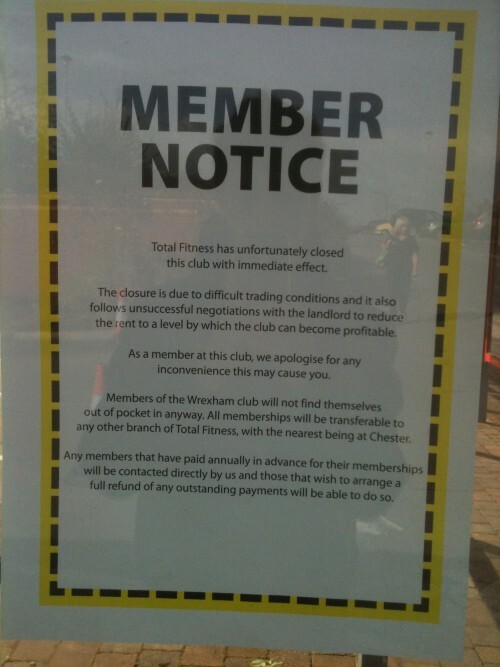 The closure notice which greeted members of Total Fitness in Wrexham this morning. 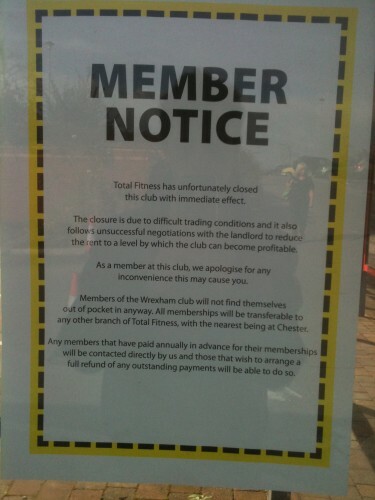 Breaking this morning is news that the Total Fitness gym in Wrexham is closed. We were tweeted of an account of a client turning up for his 7am session and being turned away. Wrexham.com understands a staff meeting has been called for today. The gym is not due to open today, nor we are told, the foreseeable future, it is understood that Total Fitness were asked to vacate the premises yesterday evening by landlords following unsuccessful rent negotiations. The closure has left 27 jobs in doubt although a spokesperson said that employees will be given the opportunity to apply for jobs elsewhere across the Total Fitness business. A security guard has been stood outside the gym all morning instructing customers that the gym is closed and staff have been told to collect their belongings from inside. 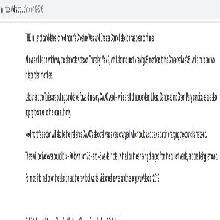 “This closure is due to difficult trading conditions and it also follows unsuccessful negotiations with the landlord to reduce the rent to a level by which the club can become profitable. “As a member of the club we apologise for any inconvenience this may cause you. One lady who had turned up at the gym to find out what was going on said that she had only signed her son up for membership two days ago and was annoyed that she had not been informed of the impending closure at the time. Additionally some members have said that they would not wish to transfer their membership to Chester due to the travelling distance. A spokesperson for Total Fitness said: “We pursued numerous avenues to increase membership numbers at the club. Several attempts were also made to negotiate with the landlord to revise the rent and safeguard the future of the club. The Total Fitness Group went into administration in October last year, however were later bought and taken out of administration under a new company name Total Fitness 2010 Limited. The company have said that this is an isolated closure and that there are no repercussions for the rest of the chain. A report on twitter said new members were still being accepted yesterday, and a staff meeting was held at 9am this morning to give further information. Any enquiries regarding the closure should be directed to the Total Fitness customer services team on 0161 440 2655. Read 1,152,834 times in last 30 days, and 73,929,010 times since we started in 2011.